An excerpt from "Coaching Psychological Skills in Youth Football"
Terms like ‘psychology’ or ‘psychologists’ have tended to divide opinion within the football industry. Within the field of coaching, it is understandable that both knowledge and perceptions of the diverse nature of sport psychology will vary amongst coaches who have very similar technical and tactical expertise in the game. However, what is perhaps more constant across coaches is an acknowledgement that psychology is important and that characteristics such as mental toughness, motivation, and composure matter to development and performance. These characteristics, of course, are not only exclusive to players. Possession of these qualities is relevant for coaches, managers, support staff, and even parents given the demands of the modern game at youth and senior levels. There are many books and resources in the football marketplace nowadays that focus on psychology. This book distinguishes itself by focusing directly on the youth coach’s role and the knowledge required to become confident in implementing a system with young players that will help them to develop. The development that we are talking about here lies not only in terms of qualities related to mental toughness, but also in terms of psychological health, personal well-being, and social skills. These qualities matter for all young players to thrive in the game, regardless of the level to which their talent is ultimately nurtured. This book is aimed at ‘believers’ and ‘not yet believers’. If you are a ‘believer’ who sees the value of a psychological approach to player development and want to pick up new ideas to integrate into your coaching practice, then this book will serve your initiative. If you are a ‘not yet believer’ who is sceptical, fearful, and lacking in confidence around psychology, then this book will challenge your beliefs by arming you with knowledge about how you can make a developmental difference to your youth players. Along the way, it will most probably reinforce many of the coaching practices and behaviours that already represent you as a coach. There is certainly a widening role for the coach in contemporary football and this involves your psychological inputs to player development. Alongside a specialist sport psychologist who would work to support you and your players in greater depth, you have a significant educational and behavioural role with young players on training and matchday. Whilst mental skills aren’t as easily measurable as physical performances on the Yo-Yo test, they are highly visible on the pitch through the attitudes, behaviours, and responses of players to different game situations. They are also highly measurable in ‘good-bad’ terms within the public sphere with clear judgements made about the mental skills and behaviour of players in off-field social situations and how players cope with lifestyle issues. Put simply, the opportunities to demonstrate psychological skills lie everywhere in football and they often arrive in quick succession. Psychological skills are required to cope with stressful and demanding situations. How well players ‘step up’ in managing these challenging circumstances is partly a reflection of the quality of your coaching. When players demonstrate thoughtful, composed and mature responses, both on and off the pitch, there should be a part of you that privately feels a sense of pride in your coaching of that player. Equally, when one of your players punches an opponent, freezes under pressure, or castigates a teammate – actions which negatively influence the game and the team – then a responsible part of you should be looking at yourself and asking the ‘Why?’ question in search of reasonable and proactive answers. 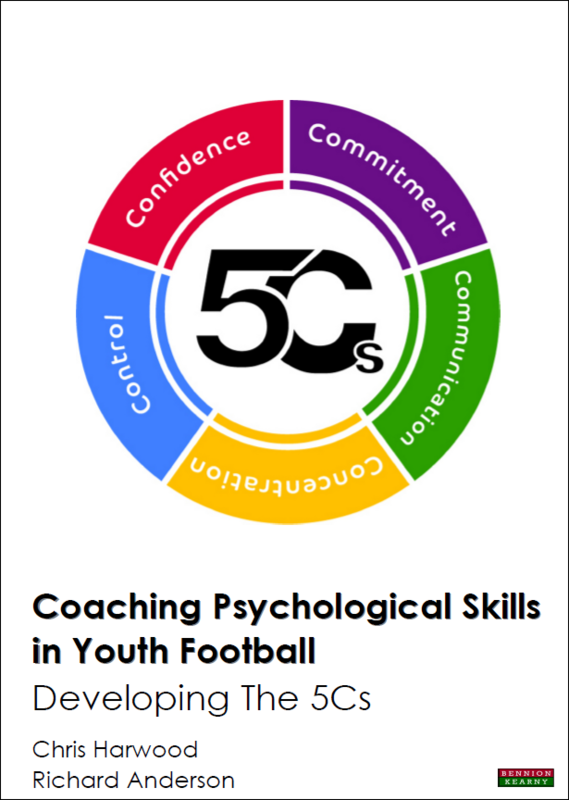 With the aim of helping coaches to feel an increasing sense of responsibility for the psychological development of their players, this book focuses on two key developmental phases – the Foundation Phase, dealing with players aged from 8 to 11 years, and the Youth Development Phase, which includes players from 12 to 16 years of age. We feel that it is important to get the basics switched on early so that players start learning about appropriate behaviours within the Foundation Phase. This sets them up well for training and executing mental skills that are important during the Youth Development phase. Subsequently, on reaching the Professional Development Phase (16-21 years), coaches will be in receipt of a more psychologically and socially adept footballer who is in a better place to make the transitional adjustments required by a potential professional player. In order to show how the psychological approach taken in this book is completely grounded within the nature and demands of football, we have created a timeline script of how the match unfolded between the two Under-16 teams introduced at the start of this chapter. We will highlight the positive and ‘not-so-positive’ psychological behaviours and responses that are common from players within each phase through the language that is often used to describe players and game events. Coaches may find it interesting to see how often basic psychological terms are used that ultimately influence players and the match as a whole. 8 minutes into the first half: Your team has made a fast tempo start. They are not allowing the opposition to get any rhythm, pressing high up the pitch, tracking runners and matching them tackle-for-tackle. There’s a real eagerness to engage in the match as quickly as possible and set the tone of the game. In contrast your opponents just haven’t got going yet. There isn’t the same level of commitment on show. Passes are tentative and the tempo slow. They can’t match the energy that your team has started with. 29 minutes into the first half: The missed chance seems to have kick-started the opposition. Their left midfielder receives the ball, drops his shoulder, and beats your right back on the inside. As he goes past him, a covering midfielder clips his heels in a desperate attempt to win the ball. The left midfielder picks himself up off the floor and puts the ball down for the free kick, whilst his teammates set themselves up for the delivery. his arms up in frustration with the referee and begins to argue. The referee asks him to calm down. Several of his teammates come across trying to persuade the referee not to show a yellow card. But it is of no use as his momentary loss of control leads the referee to issue him with a needless booking. 40 minutes into the first half: Your striker spins his marker on the left-hand corner of the box and is through on the goalkeeper 1v1. The opponent’s central defender has been caught too tight. Two of your midfielders have burst forwards, in support, having broken free from their markers. But your striker is so focused on the goalkeeper and scoring himself that he isn’t aware of the support he has. There is a simple pass across goal for a teammate to tap in, but instead the striker decides to take the ball around the goalkeeper. The goalkeeper reads it though and smothers the ball. The striker stands burying his head in his hands. Your midfielders stand and criticise him for not squaring the ball across goal for a simple tap in. After claiming the ball, the opposition goalkeeper refocuses and has sprung a quick counter attack, kicking the ball long upfield. Your team are out of position. You’ve overcommitted during the last attack and players haven’t tracked back. It’s two-against-two in defence. One of their midfielders drives forwards making it three-against-two. Your midfielders give up tracking back. They are resigned to what is about to happen. Their striker gets his head up and sees his midfielder’s forward run, playing a perfectly weighted through-ball to him. Unlike your striker at the opposite end, he keeps his composure and rounds the goalkeeper to score. It’s against the run of play but you find yourselves 0-1 behind with five minutes left to play in the first half. 1 minute into stoppage time: The goal has given the opposition an added drive, whilst your team look shell-shocked. The goal most definitely has knocked you out of your stride. The team’s cohesion and discipline has suffered. The opponents pass the ball from teammate to teammate, as your central midfielders chase the ball, desperately trying to win it back. A poor first touch leaves one of your central midfielders thinking he has an opportunity to pinch the ball. He dives into the tackle but mistimes it, sending the player crashing to the floor. The opposition players surround the referee. Your central midfielder has already been booked. They demand he be sent-off. The referee is left with no choice other than to produce a second yellow card and send him off. It’s a cruel way to finish the half but your team goes in 0-1 down and now also a player down. 13 minutes into the second half: Your players have re-grouped at the start of the second half. You’ve re-organised during half-time and are showing a persistence not to allow the opposition to dictate the game. Your captain is leading from the front, giving out instructions, demanding lots of effort from your team. The players are responding. It leaves you with hope that you may overcome the adverse circumstances and find a way back into the game. But the goal and sending off at the end of the first half have given the opposition confidence. They have come out with a positive attitude and more determination than they had at the start of the first half. 20 minutes into the second half: Your right winger receives the ball, played into him from the right back. He is encouraged to be positive and beat the full back on his own. Dropping a shoulder he crosses the ball into the box but the opposition central defender wins the header comfortably and clears it out of the box. The header, however, only falls as far as your central midfielder who controls the ball and decides to take an optimistic strike at goal from 30 yards. As the ball sails towards the goal, it takes a deflection off of an opposition player, leaving the goalkeeper wrong-footed and rolls into the net. A fortuitous goal to score but it has your team back in the game and gives them something to fight for in the last 25 minutes. In response the opposition players look around at each other supporting and encouraging one another. They urge each other to remain composed and focus their attention on getting the ball back quickly. 1-1. 33 minutes into the second half: Since the equaliser your team have been put under pressure by the opposition. Your players are becoming more and more anxious in possession. Each time a pass goes astray another player begins to hide. Nobody wants to let the side down but at the same time they are fearful of being the one to give the ball away. Passes are being sent long and the ball just keeps coming back as your team desperately try to hold on to what they have. This has given your opponents a growing belief that they can get a second goal in the time remaining. They have been more successful in raising their intensity since conceding. Dominating the ball has seen them create chance after chance, but they have been unsuccessful in finding the important break-through as you enter the final 15 minutes of the game. 2 minutes into stoppage time at the end of the game: Your team is still working hard but their body language is that of a tired team who don’t look confident they can hold out as fatigue takes its toll. The opposition’s attacks have been relentless in the previous 15 minutes, as yet another attack forces a corner and one final opportunity to win the game. As the ball is delivered in, your goalkeeper misjudges the flight of the ball and it sails over him onto the head of the opposition central defender. Fortunately your right back on the post has moved to cover the goalkeeper and divert the header off the line and over the bar for another corner. Your goalkeeper and right back exchange words, as the right back criticises the goalkeeper and demands that he “switches on” for the next corner. The second corner is delivered close to the goal. Your central defender calls on your goalkeeper to come and claim the cross, but the goalkeeper, worried about misjudging the ball again, stays on his line. An opposition striker takes advantage of this by attacking the ball unopposed to bullet a header into the back of the net from four yards out. There is barely any time left for the restart, as the referee brings the game to an end. 1-2. From the first to the last minute, the game poses challenges that will test players’ psychological skills. How well a player has developed, understands, and is in control of their behaviours and responses to these challenges, will help determine how well they can impose themselves on the game. Re-reading the match narrative and taking note of the highlighted words and phrases, you may have noticed that there are an abundance of behaviours that are important to performance from a psychological perspective. Given that all of these behaviours have a potential impact on match performance, it is important for the coach to be aware of them and their implications. Below are just a selection of the behaviours the players from both teams demonstrated during the match described over the previous pages. The colour codes for these words, above, will become apparent soon. However, let’s pause for a moment and rewind the clock. As each player’s journey to match day begins on the training pitch, let’s take a look – back in time – at what could have been happening with these players years earlier when they were being coached in weekly training session. We’ve seen the types of behaviour which occur during the game – so what behaviours may have been operating on the training pitch in the way these players were coached? We will examine the training sessions of two hypothetical squads – an Under-10 and Under-11 group within the Foundation Phase. As the coaches take their teams through a warm-up, into the main session, and conclude with a cool down, please consider what behaviours represent the engagement of these players to the session and its tasks? More importantly, consider the impact that the coach is having on these behaviours during the session, and why they are having such an impact? The coaches of the under 10 team arrive early and have already set up for the session. As each player arrives, one of the coaches tells the players to get a ball and join him in a small grid he has set up to the side of the training area. The coach asks the players to show him how many different parts of their feet they can use to turn, dribble, and run with the ball, as they move around the grid. The coach walks around the grid encouraging those who are attempting new skills. The exercise acts as a bridge between the players’ arrival and the session starting, keeping those who have turned up early engaged in a task as they wait for everyone to arrive. Not long after the last player turns up, the coach calls an end to the exercise. As the coach talks, each player listens attentively, making eye contact with the coach, facing him, as he informs them of what is going to happen next. The players move next into their warm up. There is a spring in the players’ steps with lots of visible effort and enjoyment. The coach praises players for their effort and encourages them to also praise each other when they see someone on their team do something well. The coach is quick to reinforce those players who have supported each other. The Under-11 coaches arrive late to the session so the players have been standing around waiting. Once the coaches turn up, the players start preparing for the session – rummaging through the bag of balls to find ones that aren’t flat. They then proceed to take shots at goal as they wait until the session begins. Once it appears that no more players are turning up for the session, the coaches call in the players. They stand talking to the players at length about their previous game telling them who played well and who didn’t, before talking about what they need to do in their next game. Some players try to listen but lose interest, whilst others are distracted by the training session from the Under-10’s team which is taking place on the adjacent pitch. The players are then sent for a warm up jog around the perimeter of the pitch several times. During this time the two coaches discuss what they should do during the training session. As the players jog around the pitch, some of the players stay at the back so they can have a laugh and joke and generally be disruptive to those players at the front who want to warm-up for the session the best they can. Immediately after the warm up the Under-10’s coaches quickly engage the players in what the learning outcomes for the session are going to be. Prior to each practice the coaches remind the players of what they are trying to achieve and set up aims for the forthcoming practice. coaches pose them. When mistakes are made the players just carry on and continue to try hard in a very energetic manner throughout the session. The coaches themselves make sure to go around all the groups and encourage the players individually for their effort or for the good work they show on the ball. When something breaks down a coach is on hand to help give personal feedback whilst still reinforcing the good work they have been doing. All players, whether they are succeeding or struggling with the task, receive the same attention from the coach. For the final 15 minutes of the session the coaches organise the players into a match. They challenge the players to demonstrate what they have learnt during the session and to not be afraid; to keep trying even if they don’t find success immediately. Whenever a player performs an improved skill from the session, coaches are vigilant in spotting this and acknowledging the player. In contrast the Under-11 team have very little variety to their training session. Players are standing around waiting for their turn at the drill and are having very few touches on the ball. Slowly they begin to lose interest, become bored, and start to mess about. As a result the coaches grow more annoyed with the players as the session goes on. Some of the exercises are proving too difficult for the players. Only the best players in the team are coping and the practices keep breaking down. The better players lay the blame for this at those players who are struggling. One player begins to sulk at being on the receiving end of some of his teammates’ criticism. The coaches begin dealing with this by stopping the practice and publicly telling the players that what they are doing is wrong and what they should be doing better. As some players continue to struggle, the coach compares them to the better players in the team. “Watch what Tom does. That’s what you need to do.” Even on the occasions when they do manage some success there is a lack of praise and reinforcement from the coach. Some of the players start to give up or not get involved in order to avoid getting shouted at again. With the late start and a lot of time spent by the coaches correcting ‘mistakes’ in the drills, there is only 6-7 minutes at the end of the session for a match. The better players have stopped trying hard by this point and are very lethargic. The players who have struggled throughout the session hide away not wanting the ball. The quality of the match is therefore poor, much to the frustration of the coaches. The Under-10 coaches conclude their match and call all the players in to perform a cool down. Once completed both coaches begin by praising the efforts of the players during the session. They ask the players what they feel they have done well during the session, what they have learnt and what they think they can improve on during the next session. Each player is given an equal opportunity to participate and add their views. It is a very interactive and player-led discussion to conclude the session. Once all the players are in, the coaches ask them to go and pick up all the cones and retrieve all the footballs they’ve used, before organising them and packing them up. Once done they are then free to go. The coaches then pick up all the equipment and leave. Reflecting back on the training sessions from the Under-10 and Under-11 age groups, coaches may be able to contrast the psychological and social qualities that are apparent in one group compared to the lack of opportunity to experience these qualities in the other group. In fact, the only opportunity the U-11group gains is arguably the experience and shaping of more negative and dysfunctional qualities. Reflect on how the qualities of your coaching environment impacts upon the behaviour of your player. By looking at the influence that the coaches have on the players’ experiences of training and how the interaction between the players affects that experience, coaches may be able to understand how these psychological responses translate into positive and negative actions within matches. Certainly having a clear psychological approach across coaches when working with players will help to shape the positive types of response that you want to cultivate in players across their years of development. A coach’s approach to youth players will impact on the player. Their approach will affect: the way children perceive their learning environment and if it is player-centred or not (e.g., Am I here to learn new skills? versus Am I here to show how much better I am compared to everyone else? ); their attitude to new challenges (“I will try this new skill. I may not get it first time, but I’ll keep going until I get it” versus “This skill is too hard. Others have got it straight away. I’ll do an easier skill so I get it right and look good,”); and their perceptions of how good they feel they are. This in turn affects how motivated the players are, how well they interact with teammates, and their ability to focus and deal with setbacks. For completeness, a summary of the behaviours that were demonstrated during both training sessions is presented below. Notice the similar colour coding.